I wanted to share with you another client makeover. I was contacted by a fellow Filipina from Jersey who was traveling down to Georgia for her younger sister's wedding. The wedding was actually about 2 hours away from me, but she wasn't in love with the makeup artists' work. After some last minute googling, she happened to come across an article featuring a Filipino Makeup Artist in Atlanta - that's me! My client's main concern was covering the redness and blemishes on her face. Like many, she faces adult acne even into 40 years. It's amazing how using makeup to create a clearer canvas takes the years off. In order to smooth out her complexion, I made sure to moisturize and prime. Then I applied a heavy coverage cream concealer to trouble spots. After that, I airbrushed with Temptu S/B foundation. I used this formula because I wanted to make sure her foundation lasted. She had several hours to the wedding. She was concerned about oxidation (her foundation turning darker due to oils in her skin) because this happens to her at times. I always apply a lighter foundation to highlight the center of a client's face so this tends to counteract that. Although we wanted heavy coverage, we still wanted the skin to look natural. Too bad I didn't get a before shot, it was a great transformation. 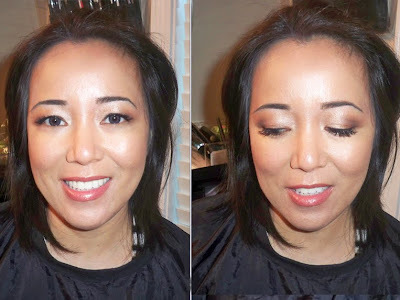 For the rest of her makeup, we wanted to go natural and look like herself but enhanced. I chose champagnes and bronzes on her eyes and applied individual lashes just to the corners of her eyes for a little lift. After, my client even went to get her hair blown out at the salon I use. She even sent me a picture! Stay tuned for another new video tomorrow! How beautiful Ren Ren! I just love all your work! Great job Ren, she looks great, i really need to take an airbrush class. She looks amazing! You did a wonderful job. OMG wow you did a wonderful job and your client is goregous! she looks gorgeous! great job ate! Way to go Renren. I just adore your work. You inspire me. she looks amazing! i love her dress too. your purple eyes in the jelly pong review is gorg as well! love your new hair! great job ren! and i love her dress! She looks gorgeous! Your work is so awesome, it truly makes people shine!